For CKGSB Knowledge, Martin Roll talks about the state of branding in Chinese companies and strategies that will help build truly global Chinese brands. As Chinese business leaders are focusing their attention on the global markets, and the next frontier for their businesses, branding and brands for Chinese companies will be important factors for future success. Many Chinese companies have realized incredible global success in recent years. Brands like Lenovo, Huawei, Baidu, Alibaba, Haier and Tencent are just a few great examples. But in reality, how many Chinese companies have really succeeded in building truly global brands? Unfortunately, there are only a few iconic Chinese global brands at this stage. 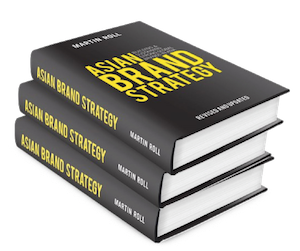 Martin Roll believes that the problem lies in how Asian – and Chinese – companies view branding. For many Chinese companies and their executives, branding is viewed as a tactical exercise, treated as advertising and promotion, and mostly it is a communication activity run by a marketing department. But to build a strong global Chinese brand, the branding and marketing function needs to be elevated to a whole new level and Chinese CEOs and business leaders need to take the lead. Martin Roll, who has rich experience in advising, observing and studying Asian companies, shared his views about the state of branding in companies, lessons from the Korean experience as they globalized successfully, and outlined the issues related with country of origin and how to get around them. For example, Japanese brands were big in the 1970s and 1980s, and South Korean brands like Samsung, LG and Hyundai started to dominate the world in the 1990s. However, in most global branding surveys, Japanese and South Korean brands still rank much higher than Chinese brands. What are the reasons Chinese brands do not rank higher yet? Martin Roll explains that it is a natural evolution. Japan came out of World War II with no resources, started almost from scratch and was forced out of necessity to industrialize to move forward. South Korea started to industrialize in the 80s after former president Park Chung-Hee got assassinated on 26 October 1979. The industrialization of South Korean companies provided international rise of Samsung, Hyundai and LG among other South Korean chaebols (large connected conglomerates). The reason why China is not there yet is the natural evolution of where China is coming from. China in reality came from a manufacturing economy, but the country is now adjusting to a new global paradigm where brands and marketing and much more market-driven measures need to take centre-stage. Martin Roll has gained in-depth knowledge and experience about the state of branding of Chinese companies, and the changes Chinese executives are facing in order to globalize their businesses and brands. Just a few years ago, a brand for a Chinese executive or a Chinese business owner would be “nice to have”. But Martin Roll believes that has changed and branding is rapidly becoming a “need to have” for Chinese businesses and the Chinese C-suite. Chinese companies now aspire to become a Coca-Cola, an Apple, a L’Oreal or an IBM – to name a few global, iconic brands that inspires Chinese businesses. It is only natural that Chinese executives want to create powerful Chinese global brands. The realization is that it will take time to achieve it, but Chinese business leaders have the aspirations and mind-sets – all they need is time and adequate resources. There are a lot of things to learn in terms of competencies and experiences to build and sustain strong branding and brands, and it may be very useful to look at insights and experiences from other global brands. Chinese brands need to figure out their future and their own destiny, but Marin Roll believes that Chinese business executives are up to the challenge. For many Chinese companies and their executives, branding is viewed as a tactical measure, as advertising and promotion only, and mostly it is viewed as being communication run by a marketing department. Chinese companies have to realize that branding needs to be elevated to the boardroom level, and they need to employ a Chief Marketing Officer (CMO) to lead the strategic branding efforts. It is required that the CMO is a senior person in order to command respect and influence in the Chinese boardroom. Marketing needs to play a larger role in Chinese companies so the CMO needs to sit at the table alongside the other C-level members. In order to deliver effectively on the brand promise, all the company actions must be delivered across all possible touch points. The marketing department cannot make that happen alone, it needs the attention and leadership of the boardroom – with the CMO as the lead person, and the CEO as the sponsor. The insight is that everything that a company aspires to stand for has to be led from the top. Martin Roll believes that the mindset has to be right in the boardroom. Chinese companies have to define very precisely what they are going to bring to the world. What will make their brands stand out? What will be the differentiation they need to effectively compete in global markets? There is a paradigm change needed in order for Chinese executives to understand that marketing is strategy. Branding is probably going to be one of the most important tools for Chinese firms. But it will take some time for Chinese companies and their executives to realize that. Then the change will come. It may look like an old example by now, but Lenovo did a very good job even though one could possibly argue that Lenovo did acquire the PC division of IBM, a Western brand. A current example is Huawei, which came out from a very sophisticated technological background, and the brand is doing a pretty good job. Huawei has realized that they need to understand better the traditional Western technological firms in order to compete effectively against them in global markets. There are pockets of Chinese companies that are now trying to step out and make it a top-led exercise by the boardroom and the CEOs. How should Chinese companies respond to this challenge of having two different kinds of customers in their global branding efforts? In the medium and long term, it is going to be very important for Chinese companies to understand the global consumer if they truly want to be global. They are going to do exactly like all the Western companies do when they expand their brands into Asia or other parts of the world including Africa and South America. Chinese companies can get inspired by successful global brands like Louis Vuitton, BMW, P&G, Apple, LEGO and a lot of other iconic Western brands. As an Asian example, Samsung went through a globalization exercise, and believed they could bring a Korean product to the world. If one look at the evolution of Samsung, it has truly become globalized and has made many places in the world their home. Chinese companies are going to do the same thing. What are some of the things that Samsung did differently outside Korea? Also, is it a unified brand inside and outside Korea? Are the messages the same? Samsung at home and Samsung outside Korea are two things. Korea is very proud of Samsung and at the same time Samsung is everywhere in the Korean society. Samsung has to keep the balance of not being too dominant in the Korean market to avoid any potential push-back from Korean consumers. For example, mobile phones are called Anycall, and air-conditioning units and refrigerators are called Samsung. So somehow they are trying to differentiate and carefully balance their brand portfolio. Samsung has pursued a different strategy outside Korea, and the Korean brand come across fairly globalized after the dedicated efforts they have out into it over the last 15-20 years led by the family-owner and chairman Lee Kun-Hee. Samsung decided to move some people outside Korea. They moved their regional headquarters to Singapore, and the brand set up several R&D centers worldwide. Samsung is really trying to learn and capture the spirit of the global consumer, not just trying to do it the Korean way only. The Korean way works very well in manufacturing and quality control, and it is a great starting point for globalization of their brand. Nobody would dispute the Korean quality. In the past 10-15 years, the advertising and marketing tactics of Samsung have evolved dramatically. The Samsung brand has become much more of a global citizen compared to the Korean citizen that the world saw 10-15 years ago when Samsung started to globalize. They have learnt, and they are still learning. They seem to be humble about it, and understand that if one want to take on Apple and wants to become the No.1 technology brand, one better be good. For many years there has been a perception that what works in China is going to work anywhere else. That is never going to be the case according to Martin Roll. The world is too sophisticated and Chinese companies need to learn about the global world as any other global firm learned about it. Global consumers are very fickle and sensitive. They want things that actually work for them in their daily life. That is why Chinese companies are going to connect in a different way to global markets. It may require a slight localization to the global markets, and they need balance between what works in China and what needs alterations and adjustments in order to be relevant for global markets. In the past, the country of origin has often been a deal breaker for many Asian brands when they went global. The companies found it very difficult to dissociate themselves from where they came from. How important is that factor today? Country of origin is very important, and brands that globalize often forget about the importance of the roots and culture. Samsung also for a period of time tried to be very global, and almost disconnected themselves from Korean culture and the Korean heritage. Martin Roll believes this is a wrong approach. If a brand eventually is going to establish a strong bond with consumers, one can compare it to two people falling in love: I need to know where you come from, your roots, your culture, how you grew up and what really made the person you are. It is exactly the same for a brand – consumers need to know where it comes from. Think of the following examples: Nobody will dispute a German car brand, a cosmetics brand from Paris or a fashion brand from Milan. Why is it then that a Korean brand finally would have secured seat at the global table? That is because nobody disputes the science capabilities and the quality aspects of Korean firms any longer. It will be the exact same thing for a Chinese brand. Made in China is often seen as low-cost and low-quality. How do you build the perception of a quality brand coming out of China? Martin Roll believes that Chinese brands have all the opportunities at hand, and that Made in China eventually will become accepted and a positive trait. China is up against some fairly negative perceptions related to food and other categories, so they have to work hard to overcome those perceptions. When Samsung rose, Korea was not a brand known for quality, but Samsung has worked extremely hard to demonstrate they can deliver, and that they deserved a seat at the table. The government-private partnership is another important factor for country branding, and for overcoming any negative perceptions of the country of origin. One of the reasons why Korea is so well-known and successful today is partly because of Samsung, LG and Hyundai combined, and the role the active role that the Korean government has played. Any government has a huge responsibility for helping companies to globalize and establish a strong country of origin perception to the benefit of the companies and the nation brand itself. Martin Roll believes that Chinese companies need to reach for the sky, be very aspirational, and simply decide that they partly are going to change the world. They need to assure that the quality Chinese brands are going to bring to the world will be world-class. Chinese companies should be demonstrating that relentlessly, they should be transparent about it, and they should prove to the world that the quality is really there. Chinese brands must define what they want to stand for, why their brands will be different, why they will be daring and bold. Chinese brands are going to think very hard about their brand identity, their unique purpose and their vision of the company. They should dare to be different. Chinese brands should not necessarily just copy what other people have done successfully. They should bring something that would enlighten the consumers tomorrow: What is really going to be successful tomorrow and inspire global consumers? That is the opportunity for the Chinese firms and their aspiring, global brands. Conclusion: Can the next Apple or Coke come out of China? Martin Roll believes that it is just a matter of time before the next Apple, BMW, Louis Vuitton or Coke could emerge from China. Twenty or twenty-five years ago, people would have never thought about South Korea bringing any global brand to the world. Martin Roll estimates that in the next 5-10 years the world are going to see a new generation of Chinese brands taking on maybe not the world at first, but trying to reach out to other Asian markets and then finally having a global footprint. In the next 5-10 years, the world is going to see maybe a handful of very strong Chinese enterprises which are strongly-led, run very professionally and have a lot of “longevity”. This means that they can not only surprise the world once, but they also have what it takes to take on the future. Martin Roll fully believes that Chinese companies are capable of bringing strong iconic brands to the world, and that Chinese boardrooms are currently stepping up to the global challenge of strategic brand building.